The motivational billboard's design was simple: It showed an image of President Abraham Lincoln and the word "humility." It wasn't a paid advertisement. It's what the industry calls a "cover" — a sign that's used when a location isn't sold. It's meant to create a dialogue. But the dialogue the sign in downtown Duluth created this week was not what the company that put it there intended. Lamar Advertising had put up the Lincoln sign on a billboard just up the street from the American Indian Community Housing Organization. It was directly in front of the mural of a Native American woman and "water protector" that covers an entire side of the organization's brick building. For some, that was an offensive juxtaposition: On Dec. 26, 1862, as the U.S.-Dakota War was ending, Lincoln ordered 38 Dakota men to be hanged in Mankato, Minn. It was the largest mass execution in U.S. history, and one of the darkest moments of Minnesota's past. The billboard prompted a flurry of discussion on social media. Ivy Vainio, who works at the American Indian Community Housing Organization and others called Lamar Advertising to complain. Vainio said the company was receptive and apologetic. They took the sign down early Tuesday afternoon. "It's supposed to be a positive message, not a negative one, so we figured if they had an issue with it, that we'd remove it and put it somewhere else," general manager Matt Harrold said. 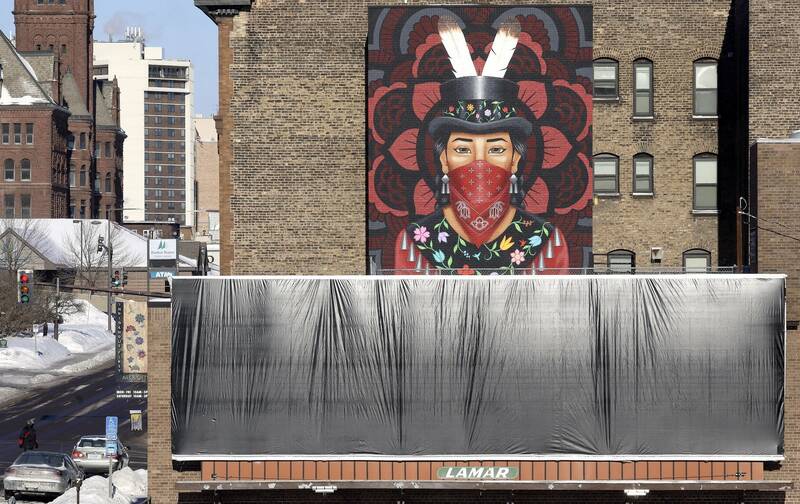 Votan Henriquez, one of the artists who painted the mural on the side of the building, was visiting Duluth for a few days this week, returning from the Indigenous Peoples March in Washington, D.C., when the billboard went up near the mural. "We just thought it was offensive," he said. "A lot of people were already discussing it online. And the conversation came up about Lincoln, and where was his humility when these people were being hung?" Henriquez is descended from the Maya and Nahua, indigenous people of Central America. He lives in Los Angeles, where he's a graphic and graffiti artist. He said the hangings have become a largely forgotten piece of history — but shouldn't be. "We feel like that's part of American history that is not being taught, or else things like this wouldn't happen," Henriquez said. Vainio described on Facebook a conversation she had with a Duluth business leader: "They mentioned how beautiful it was to have the current billboard of President Lincoln next to our building and the mural. I then told him a little about the history. He didn't know. He was never taught that history. He thanked me for this education." 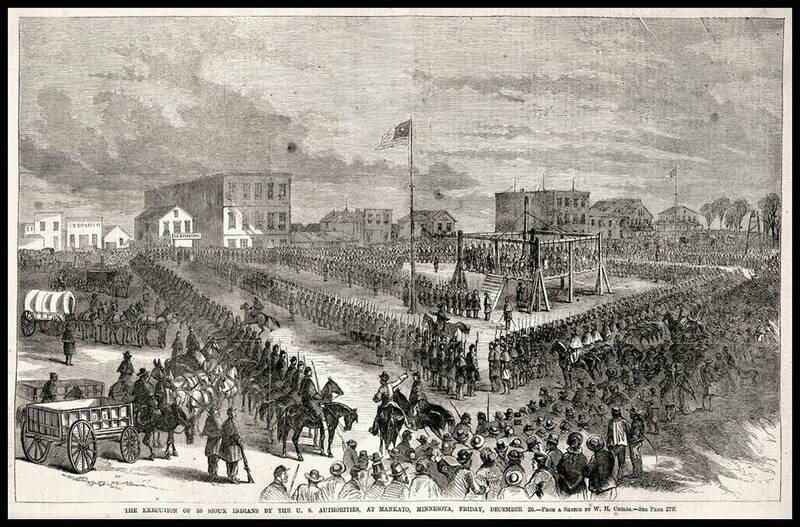 Lincoln's decision to order the hangings in 1862 came after a military commission called for the execution of 303 Dakota men after the war. Lincoln commuted the sentences of all but 39 of the men, one of whom was eventually spared. The order came three months after then-Minnesota Gov. Alexander Ramsey had called for the Dakota to be "exterminated or driven forever beyond the borders of the state." Henriquez said he realizes that some people will interpret his and others' concerns with the billboard as being overly sensitive, as political correctness runs amok. But he said it's important to spark a conversation about images and history that had a destructive impact on indigenous people. "And the only way things are going to change is if people can acknowledge [that history] and make amends with the communities that have been hurt," he said. "Because it is historical trauma. And it continues to show up." For now, the billboard in downtown Duluth remains blank. Lamar said it didn't know when or where the Lincoln billboard would be placed next.